In our lives we take many things for granted – like tap water and the home toilet. We do not know that many people, especially the less privileged ones (workers in the informal sector or residents living in slums) in the developing countries do not have easy access to those basic needs. Has the Indian government succeeded in fulfilling these basic needs of specific communities? This is one of the questions a team of young people in Chennai tries to answer with their works. 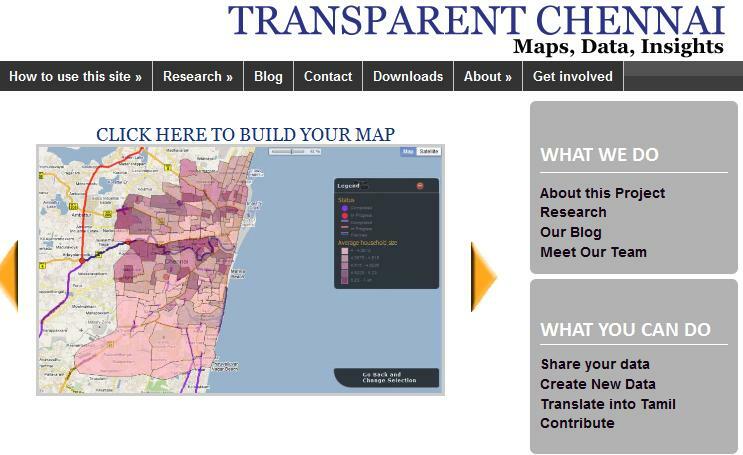 Transparent Chennai is a platform for citizen engagement and invites users, both individuals and groups, to create and submit their own data about the Indian city of Chennai. It tries to provide useful, easy to understand information about Chennai that can improve government accountability and empower residents to take action (more in the about page). Much of the data is available via interactive maps containing various layers of social, political, jurisdictional, and environmental information about the city. Staff and volunteers of Transparent Chennai have done much of the previous data collection, even though there exists an open invitation for the general public to submit their own information to the database of knowledge. With the help of a Rising Voices Microgrant Transparent Chennai will add new elements to their existing work by focusing on directly engaging two fishing villages in South Chennai. The residents of Usur and Olcott will take part in hands-on workshops where they will learn how to contribute to the map, marking the boundaries of their village, land use patterns – especially how different livelihoods in the community use space outside of their homes and along the water, identifying local resources, points of historical and ritual importance, and gaps in local infrastructure and in government services. Members of the Transparent Chennai team, aided by teachers from the Olcott Memorial School, helped the children to use Google Earth and Google Maps, and to use paper maps to navigate through their neighborhood to find important landmarks. 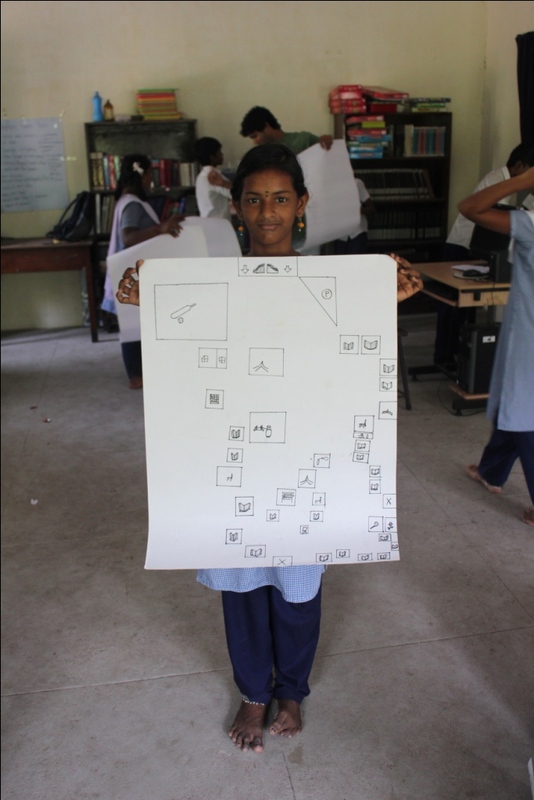 All around me, children of the eighth grade at the Olcott Memorial School in Besant Nagar are busy mapping out their school’s campus in groups, developing their own unique symbols and keys, color schemes and layouts. Working together, they turn occasionally to Shobha Narayana, their English teacher, and Siddharth Hande, TC’s workshop facilitator for help. By the end of the session, maps emerge, each diagram telling a story of its own. 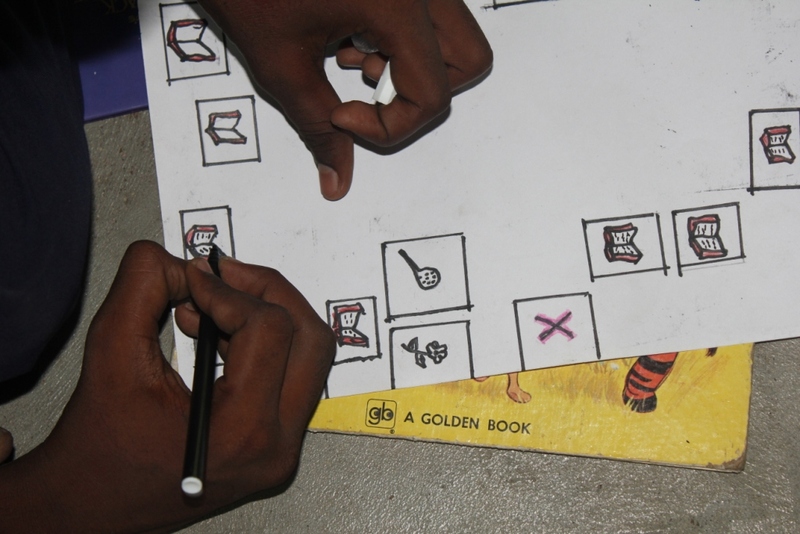 Perhaps the most interesting outcome of these workshops comes from comparing the hand drawn maps these children create. Each chart paper tells a different story, communicating nuances about each student’s life. The city of Chennai was created when the British acquired a three-mile long strip of land, including a fishing village called Madraspatnam. Fishing communities were here before the rest of the city, but today, in both legislation and in public perception, these fisherfolk are deemed trespassers on the very beach they’ve called home for hundreds of years. One path that can help rectify this frailty is by creating locally generated maps that allow us to understand the relationship of fishermen with the coastline, and to use this data to craft legislation that ensures that fishermen have access to the land they need for their lives and livelihoods on the coast. Through locally generated maps, we aim to do our part in rectifying the enormous lack of data on fishing communities. We believe that this technique, known as ‘participatory mapping’, is also one of the best ways to do this. Please check for our regular updates on this and other projects of Rising Voices and follow the Transparent Chennai Facebook page. great post rezwan. thanks from transparent chennai’s adoptive supporter! love this project. Thanks for covering it Rezwan! This takes me back to my days as a SOSE (Studies of Society & Environment) teacher in Australia. We always had to use B.O.L.T.S. – border, orientation, legend, title and scale in the secondary classes. When I visited in 1980, it was a case of where in the world is Madras. I remember the beach well.